Collection of secret writings, probably compiled and edited by the same hand, but originally not the work of one author. This appears from the fact that the book contradicts itself in regard to the person to whom its contents are claimed to have been communicated. The first part states that they were imparted by Raziel to Adam when he was driven from paradise (2a); the third part (34a) says they were communicated to Noah before he entered the ark. The book was engraved on sapphire-stone and handed down from generation to generation until it, together with many other secret writings, came into the possession of Solomon; the Book of Raziel, however, was the best preserved of these works (15, 34a). Zunz ("G. V." 2d ed., p. 176) distinguishes three main parts: (1) the Book Ha-Malbush; (2) the Great Raziel; (3) the Book of Secrets, or the Book of Noah. These three parts are still distinguishable—2b-7a, 7b-33b, 34a and b. After these follow two shorter parts entitled "Creation" and "Shi'ur Ḳomah," and after 41a come formulas for amulets and incantations. The first part, "which contains little but strange conceits ascribed to the angel Raziel, and which describes the entire organization of heaven" (Zunz), was composed at the earliest in the eleventh century, as is shown by both content and language, and by the coined words and angel-names, which number several thousand (ib.). Kohler(Jew. Encyc. i. 595, s.v. 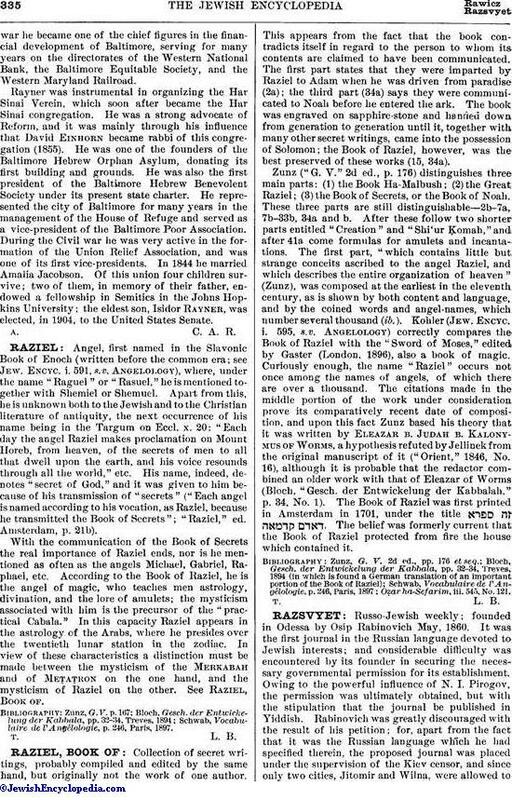 Angelology) correctly compares the Book of Raziel with the "Sword of Moses," edited by Gaster (London, 1896), also a book of magic. Curiously enough, the name "Raziel" occurs not once among the names of angels, of which there are over a thousand. The citations made in the middle portion of the work under consideration prove its comparatively recent date of composition, and upon this fact Zunz based his theory that it was written by Eleazar b. Judah b. Kalonymus of Worms, a hypothesis refuted by Jellinek from the original manuscript of it ("Orient," 1846, No. 16), although it is probable that the redactor combined an older work with that of Eleazar of Worms (Bloch, "Gesch. der Entwickelung der Kabbalah," p. 34, No. 1). The Book of Raziel was first printed in Amsterdam in 1701, under the title . The belief was formerly current that the Book of Raziel protected from fire the house which contained it. Oẓar ha-Sefarim, iii. 545, No. 121.